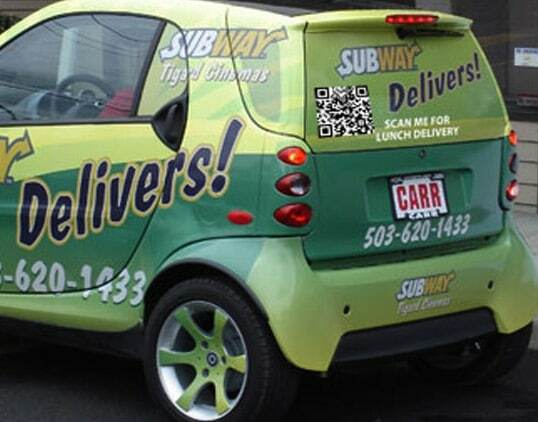 From what I have seen, the adoption of QR codes in the Restaurant Industry has been very slow. In this article, I will explain to you how easy it is to implement this hot new marketing technology into your restaurant business. I will tell you how it is currently being used as well as throw out some cool and unique ideas on how to use QR codes in your restaurant. Please note that I am not a restaurant owner, therefor these ideas may need to be tweaked to work in your restaurant. Many times, posting a photo of your entrees in your menu can be hard to do or may not fit with the style of your restaurant menu. Using QR codes, you can place a small QR code inside your restaurant menu that when scanned will lead someone to a mobile friendly website showing off different photos or even videos of the different entrees or menu items. This could help that picky eater make a decision on what they would like to purchase. With so many that are trying to watch their figure, menu nutrition information has almost become necessary. I know that I often check out the nutrition facts of most of the places I eat so I know what entrees I can have on my good days and what dishes I can have when I want to splurge a little. An issue arises when I visit a restaurant and see a menu without any information on it. Yes, normally you can ask for a nutrition fact sheet, however most are kinda shy about letting others know they are watching their weight. Simply setup a QR code on the menu that will take them to a nutrition mobile friendly site showing all the nutrition information they crave. Save on paper cost by having a QR code for your daily specials. Simply create a mobile friendly website displaying your specials for the day. This will helpyour paper costs as you will not have to print new specials each day and also can take a load off your staff from having to re-explain the specials menu each visit back to the table. You can also display photos of each item on this page. Another great idea is to also display upcoming daily specials, if you already know what they will be. This will help bring your customers back the next day for their favorite item. For restaurants that are willing to share, put recipes on a mobile friendly site allowing customers to view some of your recipes. Just be careful not to give away the secret recipe that keeps them coming back! While waiting for their food, customers may be interested in how your restaurant came about. Rather than taking up precious space in your menu, a simple QR code can lead them to the complete history of your restaurant, with photos and all. Kick it up a notch by having the qr code open a video of the restaurant’s history! Create a qr code that opens either a video or mobile friendly site with a message from the Chef or even from the owner. Here you can showcase your education, history, bio and your favorite dishes. Similar to the idea above, this idea has a QR code that leads to a mobile friendly page or video introducing your family and/or staff. This will help customers connect on a more personal level with your restaurant. Using the same method you would use to create a QR code business card, create contact information that will allow your customers to quickly and easily add your restaurant contact information into their phone. This is a great idea for restaurants that have a take-out service. Be sure if you create a contact card for the purpose of a take-out service, you place the url of your take-out menu, on a mobile friendly page, in place of the website address. This will allow customers to pull up your restaurant on their mobile phone and instantly pull up your take-out menu. This is the biggest pet peeve of mine. When I visit a restaurant, they always list a website or phone number to contact to take a survey. The problem with method is that once I walk out that door, my receipt ends up in all kinda of crazy places never to be seen again. By placing a QR code on the receipt, customers will be encouraged to scan the QR code and take your survey on their phone, maybe even before they leave. Take this to the next level by working with your software vendor to see if they can create custom QR codes for each receipt that will contain a website link with the transaction or receipt number in the variables. This would allow a customer to scan the code and be taken right to the survey without having to enter any information. If this were in place, I can say I would be taking a lot more surveys. 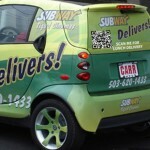 Create QR codes in your print advertising and use QR codes on your coupons to make things easier on your customers. Have a QR code on all your materials you print that lead your customers to coupons. You can even place a QR code on the coupon itself which could have a page or even video showcasing your menu. Since more and more people are becoming aware of QR codes, however there are not as many restaurants and businesses taking advantage of it, your QR code will likely cause your ad or coupon to stand out and scream “scan me”. I have found many restaurants participating in a text message sign-up or loyalty program. Many of these restaurants have a sign telling me to text “tacos” to some 5 digit number to be added to the list. That is great and all, however it still requires me to pull out my phone, open my text message program, type in the number, double check the number is right, type the text and hit send. It may not seem hard however when you are trying to watch the kids, figure out what you want to order, hassling with the line and other stresses, this task can turn into to much trouble to deal with. Here is a simple way to do it. With most QR code generators, you can create a pre-filled text message QR code. This will allow that same stressed person to pull out their mobile phone, scan the advertisement or sign and hit send. Now they are a new member of your text message loyalty program. I see most restaurants posting up flyers, banners and placards advertising upcoming events in their restaurant. Too many times, I look at the date and tell myself that I will try and attend. I do not take the time to add this to my calendar so often I forget. By adding a QR code to the event flyer, I can scan the flyer and have it automatically added to my phone calendar. Come the date of the event, my phone will remind me to go. Reward your customer with a coupon when they clean their plate. How you do this have entree plates made with QR codes printed in the center of them. You can pick the right colors to make this into a nice design. Once your customer finishes their dinner, they scan that QR code on their plate for a coupon or reward, say a discount on desert. This will help your restaurant with up sales as well as give your customers an enjoyable experience. You can also have the QR code play a funny video, tell a joke or show a cartoon similar to how Popsicle sticks do, basically, make them feel like they are a kid again! Place signs, posters and placards around your restaurant and have QR codes on them that provide a “piece of the puzzle”. Each code could be used to unlock a secret pass phrase. This works great for destination restaurants that want to have fun with their customers and encourage their customers to travel around their restaurant. Encourage them to visit your bar area, maybe a certain dining room or even scenic locations in your indoor or outdoor waiting area. The sky is the limit with this one, however it is best to try and leave the bathroom out of it. People scanning or snapping photos in the bathroom often looks odd to anyone else in there. Place trivia questions or riddles up on the wall around your dining room. Make them difficult to answer yet still fun for the whole family to try and figure out. Place a QR code under the trivia question or riddle that says “scan for an answer” and have it display the answer. Kick this up a notch by working with a programer to create a mobile friendly page that ask them to answer the question on their mobile phone. If they get it right, they get a discount code or coupon for their meal. This is a new startup that has created an app for restaurants to use QR codes for the reservation of tables. 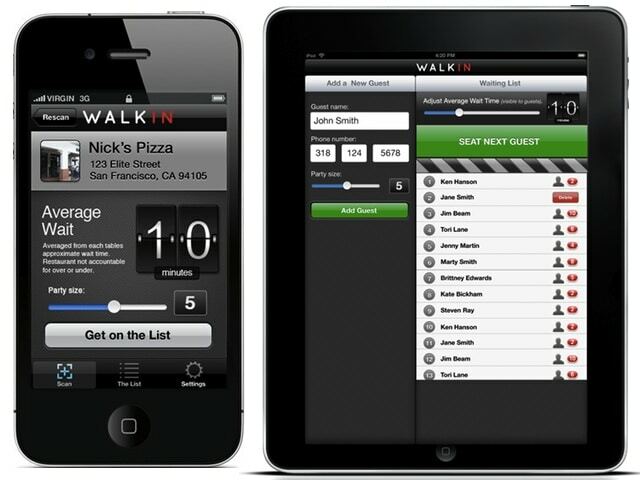 WalkIN allows you to scan a code hanging on the door and add your name and party size to waiting list. Once you have your name on the list, the phone will alert you when you are the next table to be called and then will alert you again when your table is ready. This is a great use of QR code technology for restaurants. 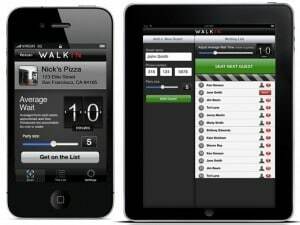 For more information on this app, please read my article, WalkIN Mobile QR code App for Restaurants. Due to the slow adoption of this simple technology, there has not been a lot of usage, at least not in my area (Central Florida). Please post a comment below letting us know about other QR code usage in restaurants in your neck of the woods. Do you have an idea or have you seen something being used that you would like to share? Please post below in the comments section. If you are a restaurant using QR codes in your establishment, please tell us how you are using them. Let me know if you have tried some of the methods listed above and what worked and what didn’t. As stated before, I am a business man but have never ran a restaurant, so my idea may need some fine tuning to actually work. With your help, we can make this list better. Have you noticed a change in the usage now it’s 2014??? I am a new business owner (food truck) and I am reading this to incorporate one on my site. I am sorry I did not see this message earlier. 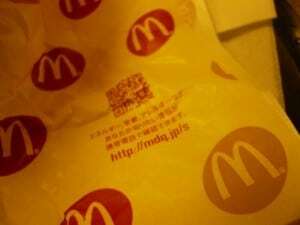 So QR codes have fallen in popularity, however, they can still be helpful. It does not hurt to use one if you have the ability to use it. For a food truck, I highly recommend Twitter and Facebook. I know I follow my favorite food trucks on those social platforms to try and catch them when they are in the area. You can use info.airmenu.com/en to create the QR Code, associate with the menu, publish on web and receive orders directly from customer smartphone. This company actually slows the process down of restaurants adopting QR code technology. This company charges 20 cents PER SCAN. That is a complete ripoff. The fact is, not everyone that scans the code will purchase the item that is being sold. That means the restaurant will most likely lose more money using this. That is the purpose of starting this blog. My goal was to show that companies can use QR codes for little to no cost. “Clean your plate” reward coupon? That’s a terrible idea. Let’s encourage people to overeat at establishments that give customers far too many calories as it is. The average meal at an American Restaurant is far to calorie heavy as it is, please don’t encourage this. Check out this restaurant we did. Nice job, we are still in progress of adding some of those features. The trivia is fun. We are getting scans from one of the signs placed over a urinal! LOL not so sure if I would want to pull out my phone to scan something in the restroom…I would be afraid that I would have to explain to people that I am not taking pictures but scanning a QR code over the urinal LOL. The Trivia idea looks very cool. Great implementation of that. What an excellent list of ideas for restaurants! I especially liked the nutritional information as that is one of my soap box topics from a personal standpoint. I also like the restaurant history idea as that is something I always look for and read on a menu, and I’m disappointed when I don’t find one. But the message from the owner in video form is a great idea too. I actually have a QR code on the back of my business card that links to a 60 second video/commercial about what I do. I’m bookmarking this post to share with all my restaurant clients! Thank you!